This e-portfolio archives and showcases new media writing projects and paper-based essays created to fulfill graduation requirements toward a Master of Art degree in rhetoric and composition at Texas State University. In 2011, when many of my colleagues were thinking about retirement — and rightly so — after taking “early buy-outs” from newspapers they’d worked for over the last few decades, I started on my second or third act by enrolling as an older-than-average, nontraditional grad student. I chose Texas State University’s rhetoric and composition graduate program for its emphasis on computers and composition, digital literacies, and pedagogical approaches to the teaching of English Composition in the 21st century. What did I know that I could offer my students from my “print” world that was transferrable to writing for online and digital environments – what to keep, what to let go of? Critical thinking and the ability to clearly construct and express meaning seem to be constants. So do drafting, brainstorming, rewriting, proofreading. What changes when those processes are produced and mediated through networked technologies? Might now-everyday digital literacies – like posting to facebook — be used to engage students, particularly nontraditional adult learners? Could class blogs help struggling student writers more quickly understand how to construct a “persona” and write for an “audience”? Would my capacity to “connect” with students face-to-face in the classroom or by handwriting comments to their journal entries diminish when “mediated” by technologies and practices increasingly prevalent in the writing classroom such as online class forums? How much new media technology might have to master? I did not know what I needed to know. Must I know how to edit a video using a cool, popular song? In the past, my background — as a professional writer who’d entered a junior college as a high school drop-out with a GED before acquiring bachelor and master degrees — defined and informed some of my unique strengths as a teacher, particularly in my work at a community college. I could offer anecdotes, entertain, “relate” to my students. But I began to wonder, after the turn of the century, what can I offer in the way of constructive insights if I have relatively little experience composing digital writing projects? This much I did know: students who grew up as “digital natives” are likely to “think different” and “write different,” “produce different.” I was intrigued – often entertained — by the proliferation and sophistication behind youtube videos with music soundtracks that feature mash-ups of pop culture memes, many created by kids just “playing” around. One way to understand digital writing is to get inside of it, to learn by doing, and reflect on the process. How else can I understand the rhetorical considerations involved in deciding whether to situate an argument as a blog or a web essay or a short video? I used class papers and projects throughout the program to inform, integrate, and act as a bridge from my previous experiences as an instructor and professional writer to my future vision of myself teaching first year writing courses with a digital writing component at a community college or state university. Though I’d been working in online media, there was a significant skills gap. I created my first power point – ever — in 2012 for a Developmental Education graduate course on “Teaching Learning Strategies and Critical Thinking.” My first attempt at new media writing as an alternative to the traditional academic essay was the blog, Madeleine de Scudery’s Conversational Salon with Ladies of the 1980s created for credit in a graduate Rhetoric course. Ideally, after I graduate, I will work with freshman writers from nontraditional backgrounds who will likely have developed digital literacies and pop culture references. I’d like to tap into their interest and use those strengths to make my classes more engaging and most of all, relevant to my students’ critical approach to civic and cultural life in contemporary American society. Assignments have been placed in the Papers or New Media pages. In the Teaching Philosophy page are my teaching philosophy, a syllabus, course calendar and writing prompts. For autobiographical context click on Bio page. 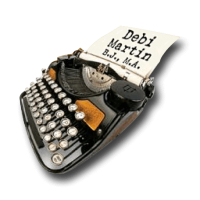 My professional writing website and portfolio of print work can be viewed at www.debimartin.com.